Who buried their child in her backyard? Beverly unearths a child’s skeleton in her backyard and uncovers a 50-year-old cold case no one knew existed. The skeleton, clad in a rotted dress, shows signs of abuse and neglect. Beverly, longing for grandchildren, finds her house and her heart given to the ghost that manifests after the skeleton’s discovery, and she is determined to discover the mystery behind the child’s death and give their spirit peace. Her mission is complicated by her and her children’s real fear of losing her mental grip and fabricating the very mystery she seeks to solve. 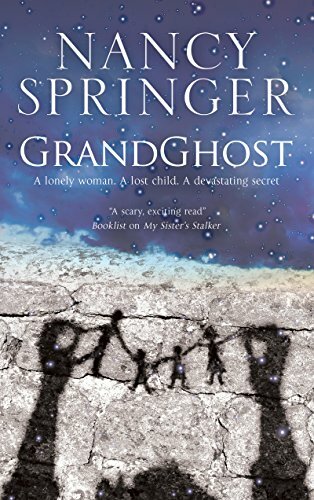 Grandghost is gripping and heart-wrenching read at times, a story of a horrific life and death, but wound around the story of a mother’s relationship to her daughters, her love for them despite their disparate personalities, her desire for grandchildren, and an artistic empathy contrasted with another mother’s neglect, hate, and violence. It’s also the story of the children who survived that mother and how they struggled to do better, despite their circumstances, and how they manage to come together to support the lost sibling they’ve worried about for so long. Grandghost is at once a mystery, a cozy, and a horror, and to me, it simply refuses classification. You’re just swept into the story and the heroine’s life, rooting for her and the child’s spirit as Beverly struggles to give the voiceless a chance to speak, to offer release and redemption, and to free the siblings from the putrid grasp of their shared horrific history. I’ve only read Nancy Springer’s fantasies before, and as with those wonderful books, with GrandGhost, she transports you into her world and makes you believe and invest in every moment and carefully crafted page. Just an emotionally-wrenching experience that resonates deeply and leaves you spent but satisfied at the resolution. Highly recommended. Determined to find out who the child was and how and why they died, Beverly notices that the portrait she’s working on seems to change of its own accord – and that’s not the only unexplained phenomenon taking place within her home. Is she being haunted – or is she going mad? In her efforts to uncover the truth behind the bones, Beverly finds her relationship with her two daughters coming under threat, and her faith and beliefs tested to their very limit.